The primary reason for the convocation of the Fifth Sobor on November 20-23, 1934 in Cleveland, OH was to elect a successor to Metropolitan PLATON, who had fallen asleep in the Lord on April 20, 1934. Archbishop THEOPHILUS (Pashkovsky), who had been serving as locum tenens since Metropolitan PLATON’s death, and Bishop LEONTY (Turkevich) were the two obvious candidates to succeed Metropolitan PLATON. As the election of the Primate was about to begin, Bishop LEONTY suggested that the council acclaim Archbishop THEOPHILUS, the most senior hierarch of the American Church, as the new Metropolitan. The council plenary session responded with a resounding cry of “Axios.” In acknowledging the council’s support, Archbishop THEOPHILUS requested that the hierarchs in attendance at the sobor privately deliberate his selection as Primate. Following a ten-minute hierarchical gathering in the sanctuary of St. Theodosius Cathedral, the bishops announced their full concurrence with the election of Archbishop THEOPHILUS as Metropolitan of All America and Canada. In view of the deepening jurisdictional divisions of Orthodoxy in North America in the ten years since the previous sobor, the council addressed the issue of church unity. The unity of all Orthodox in North America, regardless of national origin, under a single ruling hierarch began to crumble in 1922 with the formation of the Greek Orthodox Archdiocese of North and South America. The establishment of other ethnically based jurisdictions dependent on their own mother churches abroad soon followed. Additionally, the faithful of the former pre-Revolutionary Russian Missionary Diocese were now divided into four groups - the Exarchate of the Moscow Patriarchate, the Russian Orthodox Church Outside of Russia (ROCOR), a Carpatho-Russian group, the “Living Church” - in addition to the “temporarily self-governing” Metropolia now headed by Metropolitan THEOPHILUS. After much deliberation of the numerous complexities of this issue, the council reaffirmed the “temporary self-government” proclaimed at the Fourth Sobor as it was perceived to be the most canonically sound and ecclesiologically correct path to follow in order to bring all the rival jurisdictions to unity. In its ongoing work on statutes and bylaws, the council also dealt in a preliminary manner with certain organizational matters: e.g., whether the Church’s hierarchs are auxiliary bishops of the Primate or diocesan ruling bishops in their own right. The Fifth Sobor’s historical importance is three-fold: firstly, Metropolitan THEOPHILUS was elected the Church’s leader through a difficult period over the next sixteen years. 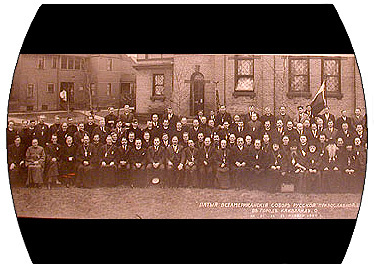 Secondly, the reaffirmation of “temporary self-government” by the council kept the Church on course towards eventual autocephaly; and thirdly, the struggle to develop the Church’s administrative structure, in the council’s work on bylaws and statutes, led to the progressive shaping of the organizational foundation that the Orthodox Church in America stands on today. OCA Archivist, Director of the Department of History and Archives.